psst - you can follow all my boards & inspirations here. What to Pack. WHATTT the hell do I pack? No seriously. I pretty much have it all under control I don't have a clue where to start, and have even been putting off writing my to do list of what to pack as I'm a little overwhelmed that I can only cram 20kg of clothes for 4 1/2 months in to my backpack. Inspiration like the below is helping tremendously though. I think another equally important decision I need to make before the weeks out is just what exactly I'll be wearing on the plane. We'll be travelling 19 hours all up (+ an hour stop over in Dubai) so I want to be travelling comfortably but of course I still want to look half decent. I LOVE this whole outfit + handbag ideas come Wednesday when we're boarding that plane at 6am - have I mentioned how excited I am? Mr M & I call ourselves the back street travelers. 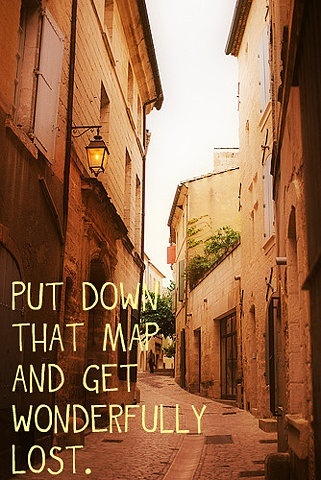 We can't wait to ditch maps and just get lost. Give us tiny holes in the walls type restaurants playing traditional music and serving generous servings with the locals ANY day of the week. When we were planning our big trip we sat together with a bottle of red wine & wrote out things we knew we couldn't NOT do. 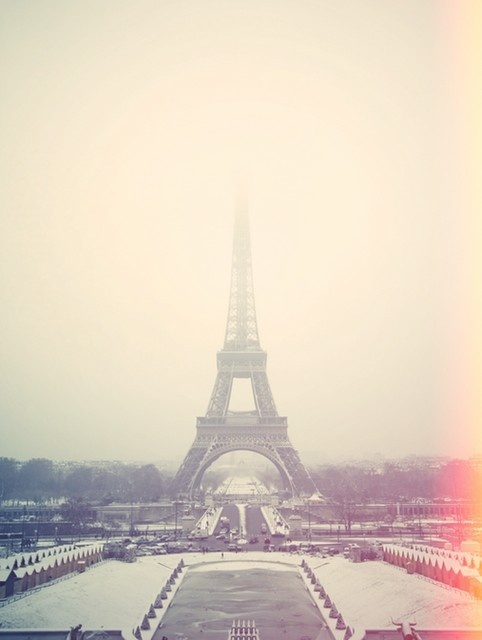 Things like ski in Switzerland, do a cooking class in Italy, and of course, kiss under the eiffel tower. Lame? Yes, but something special to us? Absolutely. Here's hoping there's a weird kind of hue like in this photo when we see the mighty piece of infrastructure for the first time eeeeeeee. 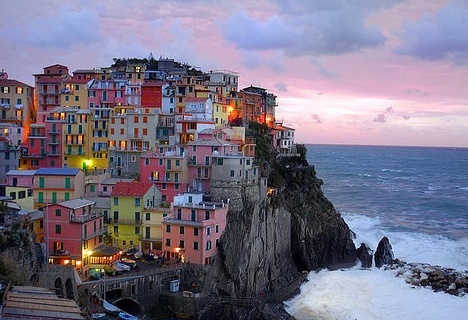 Something we're both REALLY looking forward to is walking the 5 towns of Cinque Terre. We know there was a devastating flood not too long ago so know it won't look like it's former glory but are still looking forward to it all the same. omigoodness! i just read about your amazing adventure that you are about to embark on! how exciting! the nights before are going to be restless and sleepless due to excitement for sure!!! im so jealous, but cant wait to hear about it and see pics. will you be blogging or taking the time to soak it all in ? Great clothing tips and I´m sure as long as you keep it simple and versatile there won´t be any problem with the 20 kg limit. One thing I would advise for the plane (even though I´ve never flown) is a pair of warm socks. I heard it´s really useful especially when you fly for a long time. 9 days left, that´s really very close and I believe you´re getting nervous. Don´t worry I´m sure you and Mr M will be more than fine and I look forward to all your Europe adventures. great photos! lovely post! Have a wonderful trip! Great blog. I am now following you via Bloglovin'! Hi hun, I can't believe that you only have 9 days to go!! So exciting! 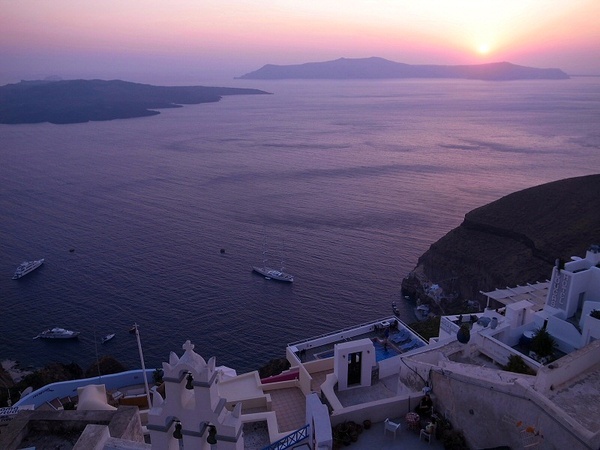 Will you be blogging about your travels while you are away? I think your choice of travel outfit is absolutely perfect, comfortable and chic as well. Ahh the photos are so dreamy, sometimes I wonder if the people who actually live in these exotic locations find it as beautiful and magical as we do, or is it just simply 'home' to them? 20kg's in the summer should be eaaaaaasy! I think as long as you have 2 weeks worth of outfits, you should be fine. I'm sure you know all about finding stuff that is versatile.... a lot of afternoons will turn into evenings! again thank you for your wonderful comment on my blog about the sumemr inspiration.